People often joke about how bad the US Postal Service is. Remember Newman? Well, I’ve had a couple recent examples that are mind boggling. I believe that they must be TRYING to be horrible. I was waiting for a release from a photographer which would allow me to publish photographs in an upcoming book (on Charger Daytonas and Superbirds). The envelope arrived yesterday, empty. 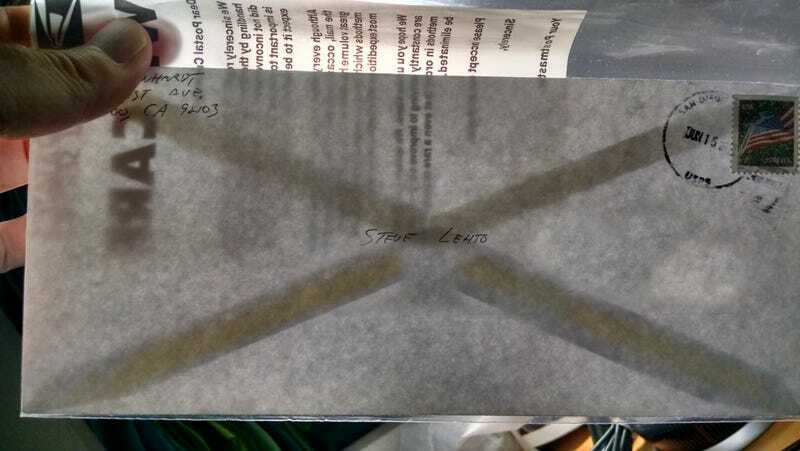 The envelope had been opened, the release removed, and then the envelope was placed in a plastic bag with a note apologizing for the “damage” they had done to the envelope. Yes, that is helpful. The amazing thing is that this is not the finest personal example I can give you of their incompetence. This is the second finest. Several years ago, I was wrapping up a book tour and had a case of books left over. I could have carried them onto a plane or checked them but the box was quite heavy and would have been a pain to drag around through airports and so on. So, I took it to the post office and mailed it home. I used Media Mail because I had shipped dozens of cases of books that way and the cost was under $20 per box. What’s so special about that box - other than it being covered with cryptic red ink? I am holding it at arm’s length and I am not strong enough to hold one of these boxes at arm’s length when they are full of books. This box is EMPTY. According to the stamps on the box and what I was told by the counter person at the post office, postal employees often open packages marked “Media Mail” to make sure patrons aren’t shipping non-media marked as media mail. The thinking is that someone might want to scam the post office out of a couple of bucks by mis-marking the box. AND, sometimes, they will root around and empty the package to see if the media on top is being used to mask non-media below. I kid you not: They removed my books from the box (retail value $400) and, once they confirmed that the box had contained nothing but media, they sealed it back up and sent it on its way. It didn’t occur to them to put the books back in the box. When it got to my local post office, they stamped it RECEIVED WITHOUT CONTENTS. After all, that is what you do when you are a government drone, working for an organization that is so horribly incompetent that you don’t see the irony of emptying boxes and then shipping the boxes to their destinations as if that is an appropriate way to do your job. Life is a learning experience and we are all learning why the Postal Service is rushing toward irrelevance. In the meantime, please check out my latest podcast. Knowing people listen is one of the few things which distract me from dwelling on the incompetence of the Postal Service.